KM 125/130 R Bp Pack 1280150204 https://www.kaercher.com/tn/professional/sweepers-and-vacuum-sweepers/vacuum-sweepers-ride-on/km-125-130-r-bp-pack-1280150204.html Easily customisable, ride-on vacuum sweeper with electric drive, Tact filter cleaning, optional sweeping crescent side brush and Teach System for wear adjustment of the main sweeper roller. Easily customisable, ride-on vacuum sweeper with electric drive, Tact filter cleaning, optional sweeping crescent side brush and Teach System for wear adjustment of the main sweeper roller. 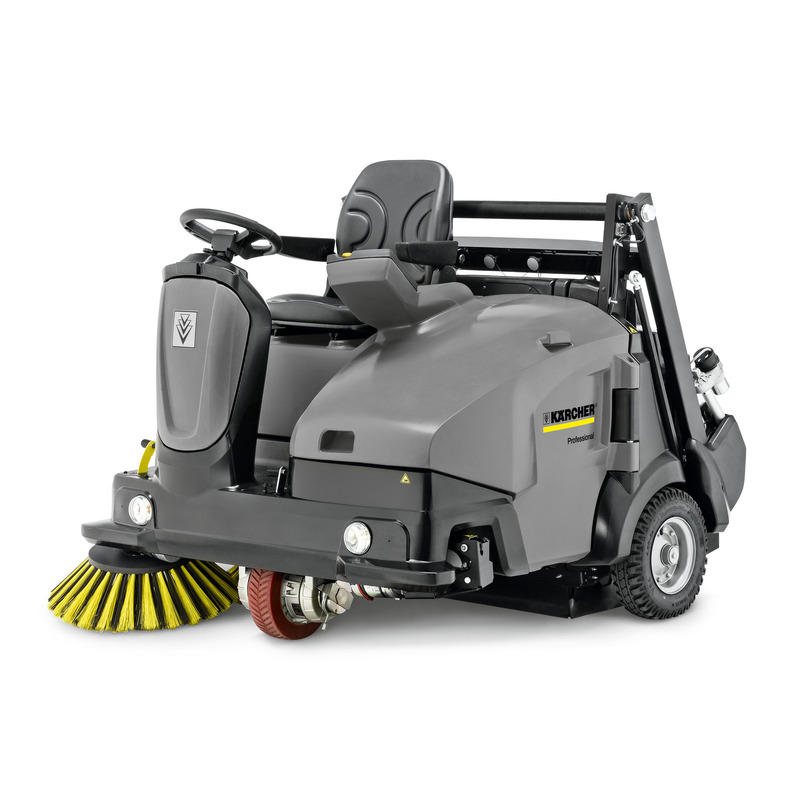 As unique as your requirements: the easily customisable KM 125/130 R Bp Pack ride-on vacuum sweeper with electrohydraulic high container emptying. Even the standard version impresses during corner cleaning with its huge time savings, since the KM 125 requires less than half the number of passes of other machines when sweeping corners. The optional sweeping crescent side brush reduces the effort to a single pass – sweeping corners manually becomes redundant. Thanks to further patents such as Tact filter cleaning, you can work without dust, while defining different user privileges with the Kärcher Intelligent Key System. Obstacles can be negotiated harmlessly, since the main sweeper roller is located between the rear wheels. If wear and tear is detected, the Teach System automatically adjusts the height of the roller, guaranteeing the best possible sweeping results. Different levels of dirt and surfaces can be tackled with the three selectable contact pressures. The selected contact pressure and the wear condition are reliably displayed on the multifunctional display. This version with electric drive also allows use indoors.